Welcome back to Something About Coins! 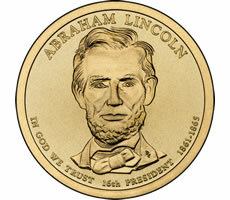 The U.S. Mint published details concerning the launch of the President Lincoln dollar coins, as seen in the first two articles. Other articles promote the Royal Canadian Mint's latest commemorative coins and a coin from a private mint featuring a meteorite. The last article reveals highlights of the incredible gold exhibition that is showing now at The Field Museum in Chicago. Enjoy!